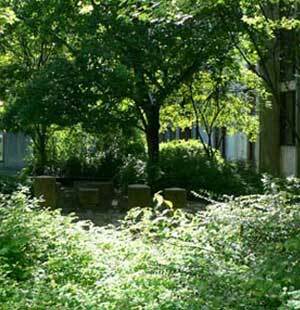 Urban parks were originally conceived to provide an escape from the city. Today, urbanites generally consider the city an attractive and livable place. Green infrastructure is no longer developed in opposition to the urban landscape, but rather as an integrated and meaningful component of it. Panelists discussed how recent projects are rejuvenating existing parks and plazas and creating new ones for the contemporary city. Horticulture is critical to defining the function and experience of these civic spaces. Creating civic spaces for urban residents today may be a more elusive task than it was before. 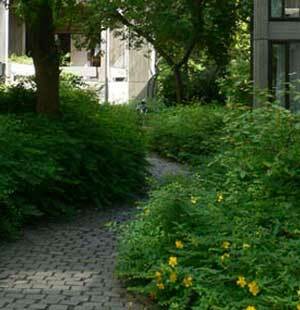 As Keith McPeters, principal at landscape architecture firm Gustafson Guthrie Nichol (GGN), pointed out, previous movements for civic improvement, like the City Beautiful movement, “had centralized definitions that could inform what ‘civic’, ‘beautiful’ or ‘improved nature’ might mean.” Today’s sustainability movement is less definitive. It has taken on many “different meanings expressed through confusing terminologies about nature, landscape, ecology, and habitat.” What then are the standards of a new civic horticulture? GGN incorporates horticulture into civic spaces both as a device to frame and organize space, and as a way to enhance the visitor experience. 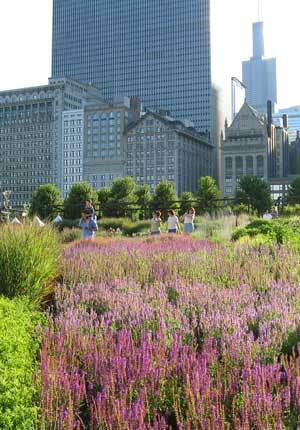 For Lurie Garden in Chicago, GGN partnered with planting designer Piet Oudolf to create a perennial garden on the waterfront downtown (see image above). An abundance of planting lines the walkways and frames views of both the city and the water. These plantings create a tapestry of color and texture that provides year-round interest. 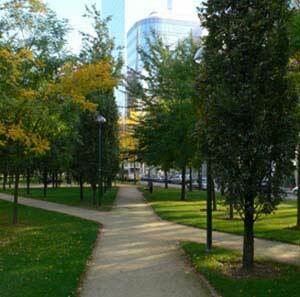 Due to its spectacular quality, the park has become one of the most popular components of the larger Millennium Park. GGN also employs horticulture in civic spaces as an organizational device for accommodating multiple competing programs within a single site. Centennial Park in Nashville is on the former site of the 1897 Centennial Exposition. In order to account for both historical and contemporary uses of the site as well as new requirements, GGN created a design that would “lend clarity while maintaining complexity.” The space had to be exceptionally scenic as well in order to showcase Nashville’s horticultural heritage. A variety of plantings throughout the site both distinguish and activate various areas and contribute to the park’s overall aesthetic. In answer to her own question, “Who’s to say what’s civic horticulture?,” Susan Weiler, FASLA, principal at OLIN, said one important manifestation is the rejuvenation of existing major parks and plazas. In Philadelphia, a rich heritage of civic horticulture dates back to William Penn’s Greene Country Towne, which carved five great squares out of the wilderness. The City Beautiful movement and other efforts subsequently led to the creation of several large civic spaces. This existing landscape and horticultural infrastructure has allowed for a “civic renaissance” over the past decade. 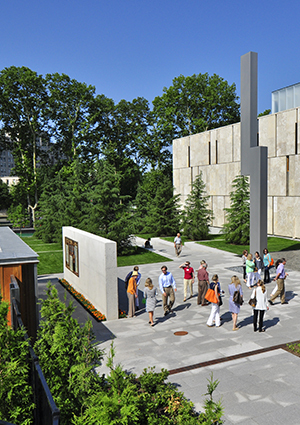 OLIN has created gardens for the Philadelphia Museum of Art, Rodin Museum, and Barnes Foundation. Horticulture plays a major role in integrating these museums into one continuous attractive system. Maintaining and supplementing the old growth trees lining the parkway provides shade and emphasizes the linearity and continuity of the park. Plantings in the adjacent public gardens tie into the parkway’s landscape and provide year-round interest. Two other manifestations of civic horticulture are the improvement of disadvantaged and decaying areas, and the protection and replenishment of natural resources. Since 2009, OLIN has supported a volunteer effort at the Richard Allen Prep Charter School, helping students express their individual idea of what a garden is. 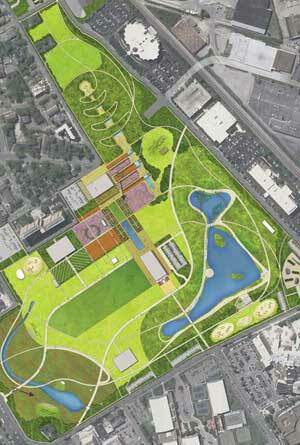 This project creates access to green space and garden cultivation for those who lack it. 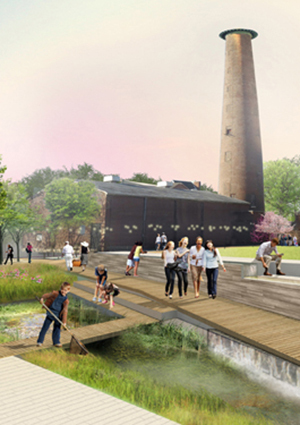 OLIN also participated in Infill Philadelphia: Soak It Up!, a design competition to re-envision stormwater management throughout the city. Their winning proposal demonstrates how green stormwater infrastructure can conserve resources while transforming neighborhoods. Peter Wirtz, Director of Wirtz International Landscape Architects, explained why it is still important to know about horticulture despite the fact that European design culture predominantly considers it “old fashioned.” Whereas horticulture used to constitute half of a landscape architect’s education, the majority of schools no longer emphasize training students in the basic knowledge of plants. Landscape architects in Europe are consequently not equipped to address warming climate demands, weakened habitats, and declining bird and insect populations. Nor do they have the knowledge of drought- and salt- resistant plants necessary for designing effectively in cities. Wirtz himself was inspired decades ago by a trip to the Soviet Union in 1970 where he observed an appreciation for urban green space evident in the abundant plantings in street medians and the mixed use of fruiting and ornamental trees. He subsequently created a design-build practice defined by the “absolute dominance of softscape over hardscape.” Advanced construction knowledge and a respect for horticulture informs creative design at Wirtz International. Planting defines the quality of civic spaces that are created to be escapes from the “bombardment” of city life. These oases deny the orthogonal urban grid and transform bodily space in microcosms or “rooms” secluded with plantings. The structure of the plantings reflects two main ideas used throughout Wirtz International’s work. 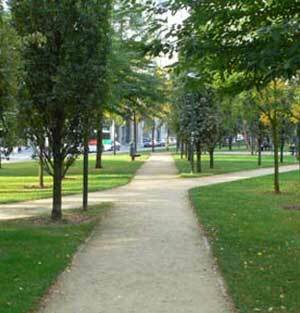 The first is that a “simple (planting) palette can create and brand the identity of a park.” This is evident on Albert II laan, a boulevard in Brussels, Belgium, where two different species of evenly spaced trees line the the linear park’s diagonal path system. The second is that an “organic composition with a robust planting palette can survive time.” This is evident at the Camillo Torres student housing complex in Leuven, Belgium, where a low maintenance scheme with dense plantings is still thriving more than ten years later. This is part three of a three part series on the Civic Horticulture conference. Read part one, The Street, and part two, Productive Gardens.